You look for an original festive and bright accessory for one of your evenings organized with a theme of blue. 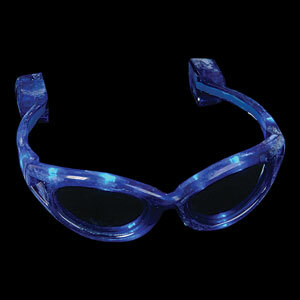 The blue flashing glasses will be perfected for your evenings. Besides carrying them in your face, you can carry them on your head. They are comfortable and hold well hair. Ideal for various opportunities such as parties, dances, anniversaries. Difficult to go unnoticed. This bright product is made of transparent blue plastic. To activate the light you simply have to press on the switch being at the end of the right branch. There are three options of luminosity. When you press the first time, the light flashes quickly, then more slowly the second time and lastly the lights are static. To put out glasses, simply rest 4th time. There is 3 AG13 batteries included and replaceable and glasses are not recommended for children under 5 years old.